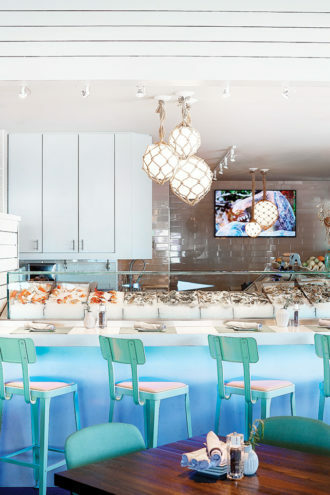 With its beach-house casualness, Lovers Seafood and Market aims to please. And most of the time, it does. Lynae Fearing and Tracy Rathbun have a tidy business model. When they opened Shinsei 11 years ago, they took over a space formerly held by the beloved Yamaguchi’s Sushi. Instead of trying something radically different, they simply embellished on their predecessor’s raw-fish idiom, adding gorgeous rice paper wraps and hits of Sriracha and curry. Their new Lovers Seafood and Market follows the same plan. It’s two blocks away, in a spot that once housed another neighborhood favorite, Rex’s Seafood. And as with their first venture, Fearing and Rathbun—the former wife and wife, respectively, of high-profile restaurateurs—showed their industry savvy by choosing not to fight against the current. Another seafood restaurant would do just fine. The only question: what would their take be? The short answer is global and eclectic, with an aim to please. As with Shinsei, there are a few stray reminders of their famous spouses. You’ll find touches of “Big Daddy” Kent Rathbun in the dill pickle salt on the popcorn immediately brought to your table. And maybe you’ll recall Dean Fearing’s dining room manner in the way Lynae holds court most evenings, moving through a dining room that oscillates from quiet to deafening. But Lovers, like Shinsei, stands on its own. Seafood comes in several times a day, six days a week, and the menu, executed by Aaron Staudenmaier, formerly of Jasper’s and Abacus, takes on Shinsei’s obsessions with modern collisions of flavor. But it never goes too far. It wants you to fall in love with it. 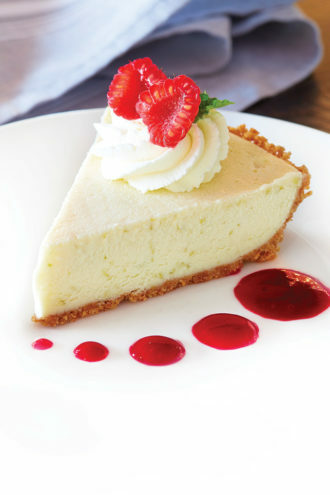 Key lime pie with raspberry coulis; the seafood market. So there are fish tacos crisscrossed with purple cabbage. Pork tamales, their first non-seafood special, arrived as tender masa around braised pork infused with tequila, neatly presented on top of their corn husk wrappers with a shower of still-tender kernels of corn, chipotle crema, and light and crumbly cotija. My only complaint was the bitterness imparted by the beer standing in for chocolate in the mole—not necessarily the bitterness I wanted. You can order a seafood slaw with a flurry of tortilla slivers and pepitas for crunch. Or the Special K salad with kale and cashews; this is the land of Lululemon, after all. 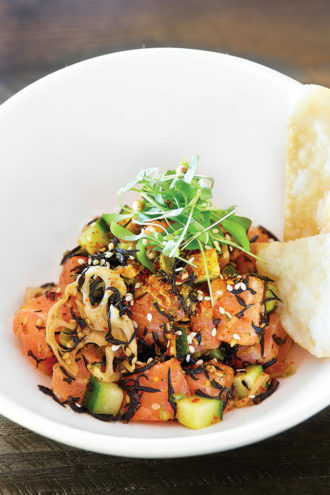 And as at Shinsei, where Hawaiian sashimi gets a blush of hibiscus, they take liberties with the pan-Asian fusion. Thai-style mussels and clams announced themselves confidently. But the evening I tried them, the clams—cherrystones—were chewy as rubber bands, the mussels plumper but still no picnic. The best elements in the dish were the micro cilantro and crisped rice “cake” (that our server took pains to describe as Japanese-style), which soaked up a sauce that remained resolutely one-dimensional. I squeezed the wedge of lime from my abandoned cocktail and felt the flavors pop. Tuna poké came with big chunks of silky ahi tangled with wakame seaweed and wasabi peas. Not a poké that someone I know, who lived many years in Hawaii, would claim as his own. He asked for soy sauce and wasabi and came up short. But it manages to be awfully good—tangy, sweet, and crunchy, with a sauce whose lime and honey tickle the same taste receptors that make us thrill at popcorn dynamite shrimp. The food is not challenging. It’s not intended to be. Will the Maine-style lobster roll change your life? No, though it’s pretty, with its pink-and-alabaster marbled flesh and tarragon-flecked mayonnaise. Look closer and you’ll find a tuna patty melt. On the other hand, hamachi crudo comes with citrusy yuzu, hickory salt, togarashi, and brilliant peppercorn microgreens that accent the mild, buttery fish with a peppery hit. Tuna tartare comes with passion fruit syrup and crispy wontons, the “traditional” shrimp cocktail with habanero sauce. The spot is not recommended for those allergic to a little fusion. Which is why I was wondering about the market fish, which you can order grilled, blackened, seared, or steamed. One evening, I asked a terrible question: what was good that night? “What fish isn’t?” our server replied. I hoped he was right. Tuna tartare dressed with passion fruit syrup; seared market fish. 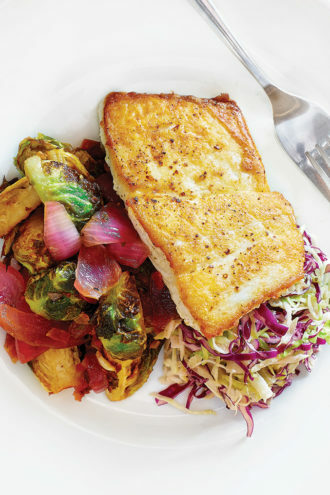 Walleye pike, a firm, white-fleshed fish from the Great Lakes, arrived with Brussels sprouts and malt vinegar aioli, which tasted nothing like malt vinegar nor aioli. But our server had said the Brussels were for malt vinegar lovers, and they were. Also for bacon lovers. Was the fillet seared in bacon fat? I asked. Our server seemed surprised at the suggestion, though it was an honest mistake; the supporting bed of vegetables overpowered its star. The flavor of the fish was lost, and if you didn’t know pike, this would offer an unfortunate impression of its texture, dense and overdone. Though the skin was crisp—this they do well. Vastly different was the halibut my tablemate ordered: pure white and tender, with a passion fruit-vanilla reduction. The sweet-tart marriage worked beautifully. It was described as having a beurre blanc, and maybe it did, though folded into a different bed of Brussels sprouts—closer to a raw Brussels sprout salad, with chile-caramelized apples. Fresh and smart, this dish was the polar opposite of the dark, oily, bacon-y mass. And so I was at a stalemate the evening I ordered the Copper River salmon, the coveted belle that launches the wild salmon season with its soft, brilliant-orange flesh, the color and texture of guava. Its poundage is counted, its season short, and the price has skyrocketed this year. At $49, it represented the highest-priced item on the menu, far surpassing the $29 farmed Faroe Islands salmon. God forbid they mistreat it. It came out a silky-centered medium-rare, deeply charred, but pink as a shell inside, with a deep, sweet flavor. Alongside roasted poblano-Jack cheese grits, it was among the best pieces of fish I’ve had the pleasure of eating, a memory that will haunt me a good long while. Lovers is not a spot for adventurous wine pairings. New Zealand Pinot and Sancerre whites are easy and familiar. The wine list does not note provenance, which surprised me. But a Sonoma Cabernet de Darioush, so dark it seemed an impostor in a seafood restaurant among the whites, was rich and rounded. And then, of course, there is brunch. A lobster-kale omelet was not as stunning as it promised to be, though it held a wealth of lobster. (Morsels from claw and tail were overdone.) Someone, however, should canonize the crab cakes Benedict, generous and plump with jumbo lump crab and poised to become their signature. On top, wobbly poached eggs come blanketed in a hollandaise that gets its color and heat from a swift sashay of Cajun blackening spices. The yolks mingle with the tender prosciutto that’s happily taken the place of ham—the imminent, inevitable collapse yielding something umami-rich and wonderful. That fusion—do we dare to call it surf and turf?—is perfect. You may be spoiled for future Benedicts. It is worth the $36 in this neighborhood.